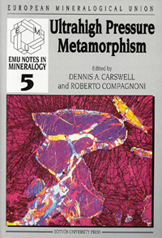 This volume, the 5th in the EMU Notes in Mineralogy series, and is the first volume dealing with a petrological subject and contains the contributions of the lectures given at the 5th School of the European Mineralogical Union (EMU) on "Ultrahigh Pressure Metamorphism" held in Budapest from 21 to 25 July 2003. The topic of UHPM was selected because this extreme type of metamorphism, initially considered as a petrographic oddity by the geologic community, has now become recognised as a normal feature of continental plate collisional orogens and important to understanding just how deep the upper part of the continental lithosphere can subduct. We note that this School took place just twenty years from the first report by Christian Chopio of coesite in exposed orogenic metamorphic rocks of the continental crust The lectures given at this school benefited by the scientific results of the research promoted by the ILP Task Groups IU-6 and I1I-8, active on UHPM from 1994 to 1998 and 1999 to 2004, respectively, and published in a number of monographs and special issues of international journals. It is our strong belief that this petrologic topic should be recognised to be of paramount importance in the education of students and young researchers in Earth Science. It is our hope that this volume, which concerns the most important aspects of UHPM, will prove to be of valuable help to all people, teachers and students, interested in having an updated and comprehensive knowledge on this special subject. With this purpose in mind, the text volume has been supplemented with a CD-ROM (edited by Franco Rolfo), where all images (photomicrographs, maps and diagrams) for which colour may improve the understanding have been stored. Finally we hope that this volume will contribute to further development in recognising and understanding ultrahigh pressure metamorphism and will lead to beneficial collaborative ventures among scientists from different branches of Earth Science. i-xii + 508 pages + CD-Rom. ISBN 963 463 6462. The text volume has been supplemented with a CD-ROM edited by F. Rolfo. It contains all images (photomicrographs, maps and diagrams) for which colour may improve the understanding. Complete detailed table of content of this EMU Note as PDF-file for download.